For every baseball fan in the world, the journey starts somewhere. Is it something you found on your own, was it something that just called your name or was it something someone else taught you the things you needed to know to become a good fan? They say baseball brings families together and more often than not helps build a bond between fathers and sons. So where did your journey begin? For me, everything I know about baseball stems from my Dad. I am a Phillies fan by birth, thanks to my Dad, I root for my hometown team, thanks to my Dad and I am not a fair weather, bandwagon fan, once again thanks to my Dad. I was raised with the notion that good or bad they are your team, and you stick by them no matter what. My Dad was raised in an era of Philadelphia baseball that consisted of two teams, the Phillies and the Athletics. During his formative baseball years, neither team was very good but he stuck by his teams. 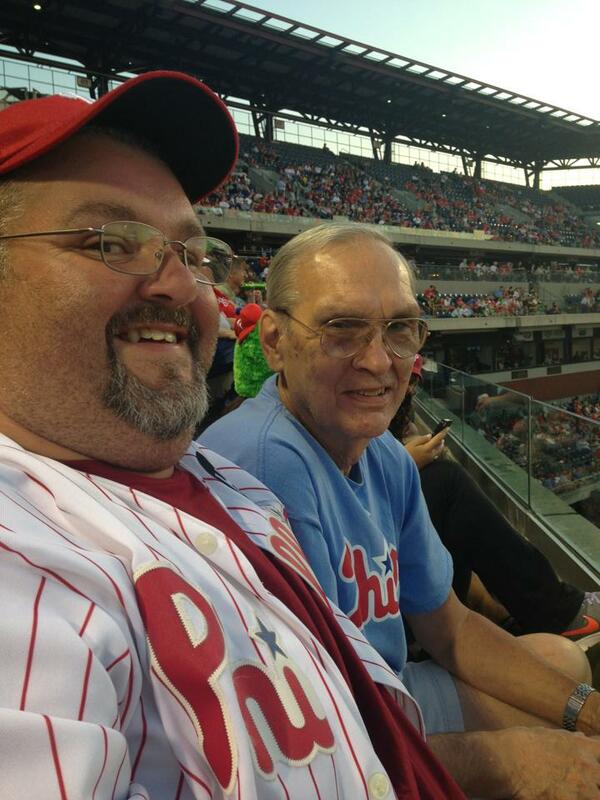 When Philadelphia became the victim of baseball re-location, my Dad’s allegiance was given solely to the Phillies. From that point on in the mid 50’s the Phillies for the most part stunk. Except for a glimmer of hope here and there, as a fan you didn’t have much to get excited about. But as I was taught growing up, you stick by your team. As I grew up, I was lucky enough to be one of the kids whose Dad took him to ball games. He traveled a lot for his job, but there was always time when he was home to fit in a baseball game at Veterans Stadium. It was there in Section 322 at the Vet that my education began. I was taught the intricacies of the game, who was a good player, who stunk and the reason why a pitchers duel was more fun to watch then a slug fest. It was an education that I didn’t realize I was getting at the time, but has proved useful thousands of times over in the days since. I am not even sure he realized he was being a teacher at the time, it was more just a conversation between Father and Son. Hot summer nights at the Vet have been replaced with Citizens Bank Park, adult duties like jobs, a wife, bills, distance and illness have gotten in the way, but we will always have the memories of the Vet and our first base line seats. No matter what happens in life I realize you can never go back to your happiest place, but I can still push the buttons on those memories and re-play them whenever I want in my head. I kept all my ticket stubs from those games when we went together and whenever I stumble across that envelope of stubs in my drawer, it brings a smile to my face. So, since it is Father’s Day I want to say Thanks Dad. You have made me the rabid Phillies fan that I am today. It is because of you, I live and die with this team. You taught me the integrity required to be a fan of a horrible team, and how not to give up even though they are 26 games below .500. You also taught me the value of a good baseball book and the broader point that you can always learn something from reading. It is these values that I hope to pass long to my kid someday, and hopefully I will teach them what they need to know about baseball and life, half as well as you taught me. Veterans Stadium is long gone, but the legacy of me and my Dad at a baseball game on a hot summer night will live on with me forever. Happy Fathers Day Dad, I love you and we should probably take in a Phillies game real soon.